Mogami receives hundreds of emails each year from artists, engineers, music schools, AV integrators and studio owners thanking us for making quality cable for live performances and recording. Slash is the legendary guitarist behind the classic riffs on "Sweet Child o' Mine" and "Paradise City," performed with Guns N Roses, and he's the backbone of the bands Velvet Revolver and Slash's Snakepit. Chosen by a Time magazine survey as the second greatest electric guitarist of all time behind only Jimi Hendrix, Slash's place in rock history is, like his Hollywood star, cast in stone. Slash's career took off in 1987 with GNR's first release, Appetite for Destruction. 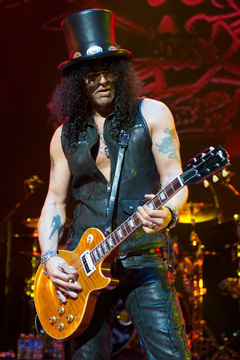 After a successful nine-year run with GNR, Slash went on to release two platinum albums with Velvet Revolver, winning a Grammy for "Slither "off their first album, followed by a successful album with Slash's Snakepit. In 2010, Slash released his first self-titled album with a lineup of music's biggest names supplying the vocals. In 2012, he released Apocalyptic Love featuring Miles Kennedy and the Conspirators, which is enjoying critical acclaim. Slash featuring Miles Kennedy and the Conspirators are now on a world tour. Slash's signature sound is a mix of pure talent, a Les Paul guitar, a Marshall Amplifier, and now MOGAMI cable.